It’s that time of year again – ya know, WINTER. Y’all – it’s COLD out there and that means it’s time to prepare your house to withstand the not so warm temps. 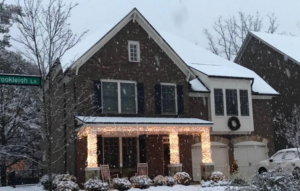 Here are a few tips from The Peters Company to keep your house in great shape to avoid any winter weather problems this year! 1. Plumbing – The biggest cold weather culprit is a burst pipe! Water + Cold = Ice and you do not want that exploding unexpectedly. To avoid this potential disaster, drain the water from outdoor faucets and hoses (and don’t forget the sprinkler system!) Inside, in extreme cold snaps let your faucets drip and insulate pipes that could be problem areas (near exterior walls, etc). 2. Chimney – Be sure to have your fireplace checked out! Have it cleaned and checked by a professional company. Cracks in the firebox can lead to big problems, and a dirty flue is very unsafe. 3. Furnace – No one wants surprises when it comes to their heat source in the winter, so have an annual inspection performed by a licensed HVAC company. Their routine check should include vacuuming the vents and other components and checking the filter for possible replacement. And don’t forget about energy savings by turning the thermostat down overnight and when you’re away!